This three temperature or HI-MED-LO & Off seat heater kit has a digital controller for more controlled and consistent heating with a 6 LED illuminated membrane switch. The Premium Kit hardware pack makes your job easier and faster with an Add-a-Circuit mini-fuse adapter and controller mount. 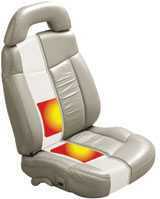 These Seat Heater elements are paper-thin, and install between the seat cover material and the seat cushion. They are fully water-resistant (not waterproof) and pose NO problem with damp winter cloths, spilled beverages, or wet pets! They are NOT visible and do not detract from the finish or look of your vehicle's factory upholstery. Our kits are of the highest quality and meet and exceed original equipment specifications. The seat covers are easily removed and the heating elements are adhered to the seat base foam. The seat cover is then re-installed according to the original factory design. The seat heaters do not change the look of the seat, but they do enhance the feel and comfort. Each seat heater system is individually fused and safely wired into the vehicle’s electrical system. A separate lighted switch is provided with each system. The comfort and pleasure of heated seats is now available in three product levels for most vehicles, and can easily be installed by your dealer or your local auto upholsterer. These wire element Seat heaters quickly provide comforting warmth to the body through the seat’s cushion and back long before the vehicle’s heater has a chance to heat the interior. The new Dual & Twin Sets form a single kit for both front seats using shared common parts. With the Dual kit, you only need to install one controller, one switch (Classic & Twin kits uses 2 switches) and make one connection to power for both front seat heaters. This greatly reduces installation time resulting in greater profits. Every seat heater is backed by the industry leader in aftermarket seat heaters. Using innovative thinking, the latest technology and highest quality materials to manufacture and assemble each seat heater kit. We also conduct ongoing rigorous testing to meet government and industry standards and insure long-term durability and reliability. That is why every seat heater kit comes with a 3 year/36,000 mile warranty. Two seat heater kits in one easy-to-install kit, providing state-of-the-art features for both the installer and the customer. A new generation LED ultra thin membrane switch regulates temperature settings and provides diagnostic feedback. The 1/16” switch has a peel and stick backing for easier installation in a wider variety of locations. The “brain” of the system is an electronic controller that runs both front seat heaters. The module tightly regulates 3 temperature settings and provides diagnostic feedback at the LED switch. This new controller also has a power management feature that monitors power draw to avoid potentially damaging current overloads. With less wiring to run and only one power connection, the FrontSet kit is easier to install. The new patent pending fuse adapter has a green LED that lights up signaling correct polarity when connected to power. Power requirements vary by kit and range between 51W (3.7A @ 13.8V) & 84W (6.1A @ 13.8V). GM Licensed for 2005 & Older vehicles. NOTE:Seats with Side Airbag Sensors will only receive 1 Pad and $20 Refund. Complete kit includes a bottom cushion element & back element, 24" power harness, controller, installation CD, 5' switch harness, LED membrane switch and hardware pack for 1 seat. Click HERE to see if there is an application for your vehicle before ordering. If you cannot find an application, the Universal fit Carbon Fiber Heating element will work or the Plug & Play Heated Seat Covers. The manufacturer has developed a video that takes you through a typical installation of a Seat Heater kit. The video can be downloaded right into your computer for viewing by clicking on the desired resolution below. You may right-click on video and select "Save As" to save the video to your computer. Even though this kit is licensed by GM, the OEM version is different and this kit will not plug and play with OEM versions. GM Licensed for 2005 & older models. Order Single Membrane includes 1 single Membrane Switch for easy placement in the Center Console or Instrument Panel. Order Dual Membrane includes 1 Dual Membrane Switch for easy placement in the Center Console or Instrument Panel with 1 power harness for 2 Seats. Order Twin Membrane for 2 Single Seat Heater Kits with 2 Single Switches and 1 Power Harness. Order Classic (Single or Dual) Three Temperature Hi-Med-Lo switch seat heater for installation in the seat trim. ** Not all Make & Models are available for Every Year ** You will be contacted by email if your Vehicle year, Make or Model are not available.